Before I jump into things, you're gonna need a quick overview of our home. 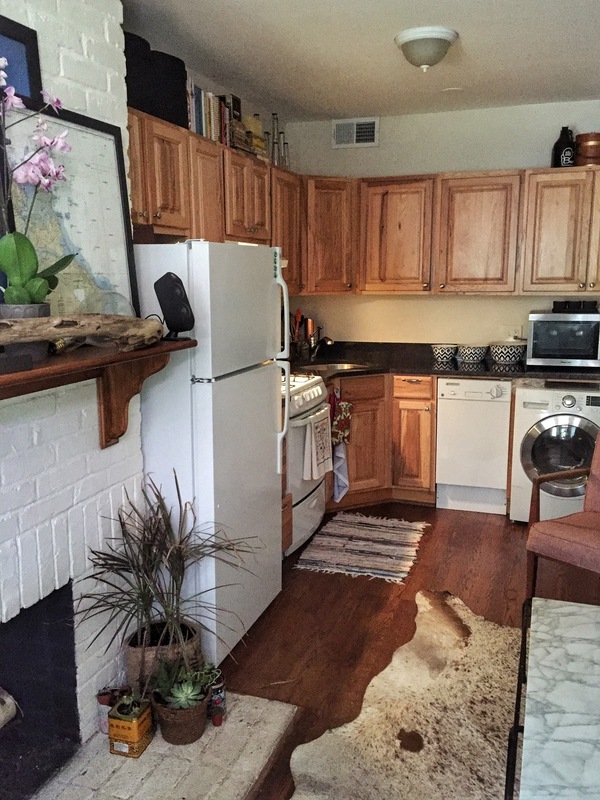 We are the first floor of a 3 unit row house on Capitol Hill, near Eastern Market. There are couples in the English basement and on the second floor. We have a few steps outdoors leading up to the front door (see picture from Friday's post); once you're inside, our door is immediately to the left, and our upstairs neighbors head up the stairs to their own door. Inside, there is one large (HA) common space. It starts in the front of the house with a bay window area, complete with lovely stained glass. This feature fits my "charm and personality" necessity for sure. On our first morning it cast a lovely pink glow over all our crap. In this picture, our front door is to the left and there is a small nook-like area on the right, behind the (non-working) fireplace bump out. That's where our dining table is going to live. 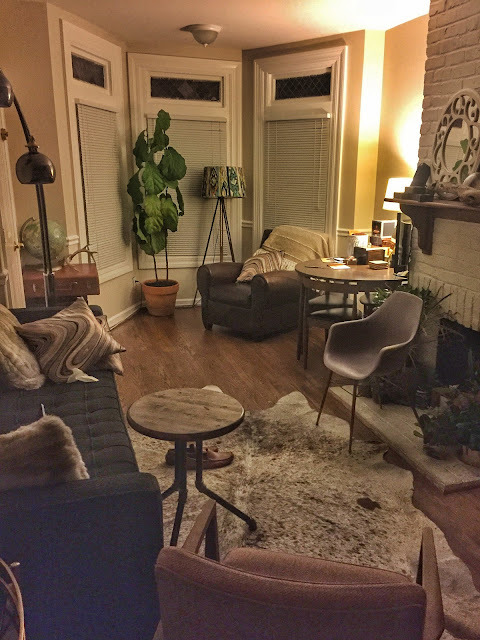 Big 'ol leather chair and the dinosaur plant, AKA fiddle leaf fig, will live in the bay window area. It's painted a neutral taupe-y gray, which I'm fine with, and has molding running around about 1/3 of the way up the wall. Pretty, clean, it works. The fireplace is painted white. The room is so small that our fridge literally touches the fireplace, which is the only feature in the room that bums me out. You can sit on our crazy long 7 1/2 ft couch and look straight ahead at....GE's finest white fridge. Oh well. The common area is a long and narrow room that ends with our kitchen area on the left and a hallway on the right. The hallway has a decent sized closet on the right and the bathroom on the left, stacked behind the kitchen. The hallway ends in our bedroom. The back wall of our bedroom is mostly windows, the right wall of our bedroom is all closets. There is a lovely view onto foliage, flowers, and a back patio out of our bedroom windows, but we don't have access, sadly. Our place is small, and sadly somewhat dark, but I LOVE IT. I can't wait to come visit and see it in person! Love the charm!! !